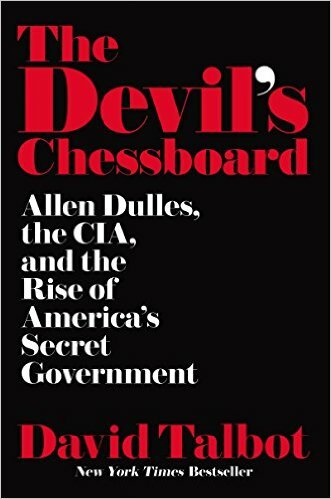 In The Devil’s Chessboard: Allen Dulles, the CIA, and the Rise of America’s Secret Government, David Talbot, the journalist who founded Salon.com in 1995 and wrote a great book on the lives of John and Robert Kennedy, Brothers (2007), has produced another page-turner that unearths mountains of new evidence about the seamier side of the rise of the United States’ Cold War national security state. Talbot has achieved something rare in our scholarly discourse these days on the origins of the Central Intelligence Agency and the men who were responsible for shaping the Cold War ethos that for decades dominated American foreign policy in the 20th Century. By presenting the contours of Allen Dulles’s life and his everlasting imprint on the nature of the CIA in a cogent and highly readable way, Talbot offers us a new and sophisticated analysis of America’s secret Cold War history. The Devil’s Chessboard is quite simply the best single volume I’ve come across that details the morally bankrupt and cynical rise of an activist intelligence apparatus in this country that was not only capable of intervening clandestinely in the internal affairs of other nations but domestically too. Talbot’s exhaustive research, lively prose, strong moral conviction, and the ability to convey history’s relevance to our contemporary politics make The Devil’s Chessboard an invaluable contribution to our understanding of the institutional transformation that took place in this country at a time when rabid anti-communism dominated the thinking of foreign policy elites. Some passages of The Devil’s Chessboard have a plaintive tone, a kind of lament about the irreparable harm the fanaticism of fighting the Cold War against Soviet Russia (and its alleged proxies all over the world) had on shaping a set of unaccountable secret institutions that have both distorted our politics and undermined the “democratic” principles for which the U.S. supposedly stands. Exceedingly rare among baby boomer journalists and public intellectuals, Talbot does not shy away from pointing to the uncomfortable facts surrounding Allen Dulles’s life’s work. He chronicles Dulles’s secret activities just after World War Two as a young intelligence agent in Europe helping to establish “ratlines” so Nazis considered useful to the United States in the new Cold War against the Soviet Union could escape prosecution. Talbot also unpacks Dulles’s foundational role, first as a deputy director and then climbing to become director, in setting the course for the newly-formed CIA after President Harry S. Truman signed the National Security Act of 1947. What followed under Dulles’s leadership were many unaccountable CIA projects that had to remain secret or spun with propaganda to suit the widely-held Cold War fantasies of the period lest they be shown to be so contrary to America’s self image they might generate opposition. Secret CIA activities in the 1950s under Dulles’s watch included horrifying experiments in “de-patterning” and “mind control” involving LSD and hypnosis (often on unwitting subjects) to try to develop the means to “turn” Soviet agents (MKULTRA). Subsequently, Dulles led the CIA in its first experiments in “regime change” with the coups in Iran in 1953 and Guatemala in 1954. It was Dulles’s CIA that played a key role in killing the nationalist leader Patrice Lumumba in the Congo in 1960, and setting up the failed Bay of Pigs invasion of 1961. At times The Devil’s Chessboard reads like an engaging spy novel proving yet again that fact is stranger than fiction. The book is full of intrigue and revelations that should make any fair-minded reader cringe at what the CIA has done in our name over the years. Dulles, who was by far the most influential director the CIA ever had, Talbot shows, was for decades at the center of a secret American foreign policy. The author clearly understands power and he knows the extremes to which America’s “intelligence community” was willing to go to “save” the country from the communist hordes. While serving as a young Office of Strategic Services (OSS) operative in Europe, Dulles participated in “Operation Sunshine” whereby any former Nazi who was either deemed a “gentleman” (meaning wealthy) or had any information or skills that might be useful to U.S. intelligence in the new Cold War against its former ally, the Soviet Union, could by whisked to safety far away from those pesky Nuremberg trials. Thus begins the history of the United States’ secret government with Allen Dulles present at its creation (and soon at the helm) showing that in the name of fighting communism the end would always justify the means, even to the point of forging alliances with those who assisted Hitler’s madness. After President Eisenhower appointed Dulles Director of Central Intelligence in 1953, “the CIA would grow more powerful and less accountable with each passing year of Dulles’s reign.” (p. 223) Talbot sheds new light on Dulles’s role in the CIA-engineered coups in Iran in 1953 and Guatemala in 1954. These were watershed events in the history of the CIA since the Agency had never before engaged in fomenting “regime change” and, according to President Harry Truman, was never intended to function as an operational arm of U.S. policy in that way. Among the many disturbing revelations in The Devil’s Chessboard is the fact that Dulles, after being kept on as CIA Director by then President-Elect John F. Kennedy, failed to inform the incoming Chief Executive during multiple briefings that the CIA had already participated in “neutralizing” the Congolese leader Patrice Lumumba. The CIA under Dulles never bothered to tell President Kennedy about Lumumba’s murder (even though Dulles briefed the new president on January 26, 1961 about the situation in the Congo). President Kennedy had to hear the news second hand from his United Nations Ambassador Adlai Stevenson. (p. 387) Hence, from the start of the Kennedy Administration Dulles kept secrets from his new boss. No episode better illustrates Dulles’s separate agenda than his agency’s planning and execution of the Bay of Pigs invasion of Cuba in April 1961, which ultimately cost him his job after President Kennedy sacked him (and Richard Bissell and General Charles Cabell). On the subject of the Kennedy assassination Talbot offers one of the most comprehensive and thoughtful discussions of any book to date. In fact, if one reads carefully The Devil’s Chessboard along with James Douglass’s superb book, JFK and the Unspeakable (2008), the reader will come away with a deeper understanding of the “crime of the century” that synthesizes the most relevant details that fifty years of scholarship and investigation have provided. Since President Kennedy’s alleged assassin, Lee Harvey Oswald, was himself murdered in the basement of the Dallas police building on November 24, 1963, there would be no trial. In its stead the nation was given a non-adversarial process of a presidential commission that runs counter to the norms of American jurisprudence, and which clearly had drawn the preordained conclusion that Oswald had “acted alone” before the first witness was ever called. One of the many questions that Talbot answers in this book is the curious phenomenon of a right-wing Republican, Allen Dulles, whose professional and personal connections exclusively consisted of wealthy Wall Street bankers and lawyers, spies and spooks (like James Jesus Angleton), and foreign policy elites tied to the Rockefellers and the white shoe law firm Sullivan and Cromwell — who President Kennedy fired after he sensed Dulles lied to him and could not be trusted — would find himself heading the commission charged with “investigating” the murder of a president that Dulles neither liked nor respected. There were no Kennedy allies on the Warren Commission. Only Republicans and Southern Democrats. J. Edgar Hoover controlled the physical evidence in the case and Dulles was in the pivotal spot to guide the inquiries or witnesses away from any fingerprints of intelligence agencies in concocting Oswald’s “legend” or in the events in Dallas. Serious students of the Kennedy assassination, regardless of their views of the Warren Commission’s “findings,” must read The Devil’s Chessboard if for no other reason than to flesh out Allen Dulles’s role in guiding the public’s perception of the crime of the century. The guy ran away, because he probably became suspicious. They wanted to kill him on the spot before he could be grabbed by the judicial system. Unfortunately, it didn’t happen exactly the way they probably planned it would… But a trial, you realize, is just terrible. People would have talked. They would have dug up so much! They would have unearthed everything. Then security forces went looking for [a clean-up man] they totally controlled, and who couldn’t refuse their offer, and that guy sacrificed himself to kill the fake assassin – supposedly in defense of Kennedy’s memory! You’ll just have to read The Devil’s Chessboard to learn about the layers of the onionskin Talbot expertly unravels regarding the killing of John F. Kennedy. In an era where it’s given that Wall Street is untouchable, the President can use drones to kill anybody anytime anywhere, and the country has apparently accepted the “new normal” of warrantless mass surveillance by the NSA, we need to know about this history. The good news is that compared to the baby boomer historians, commentators, journalists, and other opinion makers who are too bought into the status quo to even dream of questioning the Dulles Commission’s bogus methods and conclusions regarding the JFK assassination, the young people today are far less kowtowed by the threat of being thrust into the “tin foil hat” conspiracy crowd. To young people the Kennedy assassination isn’t a primordial childhood event that shaped their worldview like it is for the boomers. It’s far more remote, like Lincoln’s assassination, something that happened long ago with little direct relevance to their lives. Hence, young people today don’t see what the big deal is in contemplating the idea that elements that arose out of the same corrupt and morally bankrupt secret government that helped Nazis escape prosecution, brought down foreign democracies, or experimented with mind altering drugs on unwitting subjects, might not see any clear limits to their crusade to save the world from what they believed was an existential threat by turning their violent capabilities inward. In today’s parlance we call it “blowback,” and one doesn’t need to wear a tin foil hat to grasp the potential consequences of allowing unaccountable power to fester. People entering college today were born in the early 1990s and have no direct life experience with the histrionics of the Cold War. What made Reagan’s first term all the more frightening was his administration’s thinking out loud about the “unthinkable” at a time when the United States was deploying Pershing II nuclear missiles and nuclear-tipped cruise missiles to West Germany, bulking up and modernizing its B-1, B-2, and B-52 bombers, and launching new intercontinental ballistic missiles (ICBMs) systems, such as the M-X “Peace Keeper” missiles, the new D-9 submarine launched ballistic missiles (SLBMs), and a high-tech space-based anti-ballistic missile system (called the Strategic Defense Initiative). Those days of nuclear brinkmanship and alarmism against the Soviets and the widely disseminated propaganda that farm workers from El Salvador were going to spread communism into south Texas are as remote to today’s college students as Prohibition was to the baby boomers. Thankfully, students today don’t possess the knee-jerk attitude of their parents and grandparents toward looking at the guilt or innocence of Lee Harvey Oswald. “Millennials” have no problem contextualizing the Kennedy assassination inside the rabid anti-communism of a by-gone era. They can also Google in a minute more information than I could acquire in a week when I was an undergraduate concerning the history of the unchecked power of the CIA and the national security state. Perhaps at some point, maybe when the last baby boomer apologist for the Warren Commission passes from this good earth, the country will finally be able to get the realistic understanding of the events of November 22, 1963 it deserves. David Talbot’s The Devil’s Chessboard lights the way forward for those who still cling to the belief that history and truth matter.